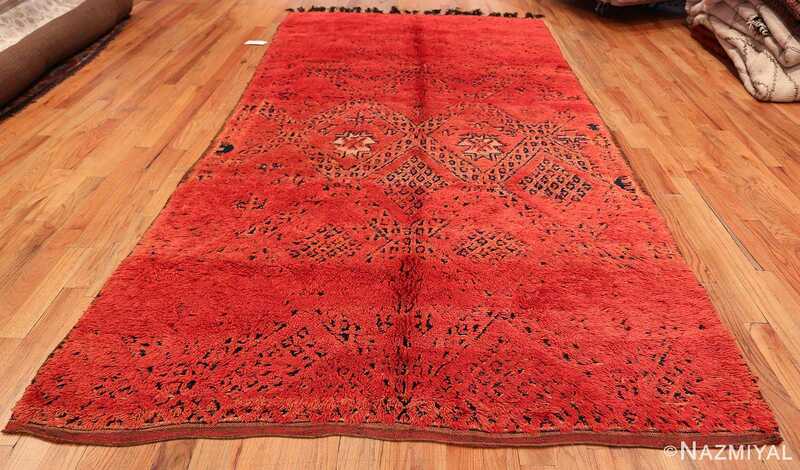 Beautiful And captivating Vintage Gallery Size Double Sided Red Berber Moroccan Rug, Country of Origin / Rug Type: Morocco, Circa Date: Mid – 20th Century – This spectacular wide hallway gallery size double sided vintage Moroccan rug is masterfully created to have two different designs and looks, depending on which side you decide to display. One side of the vintage mid century rug is a fiery red all over design with a subtle black and white design that shows through the pile. 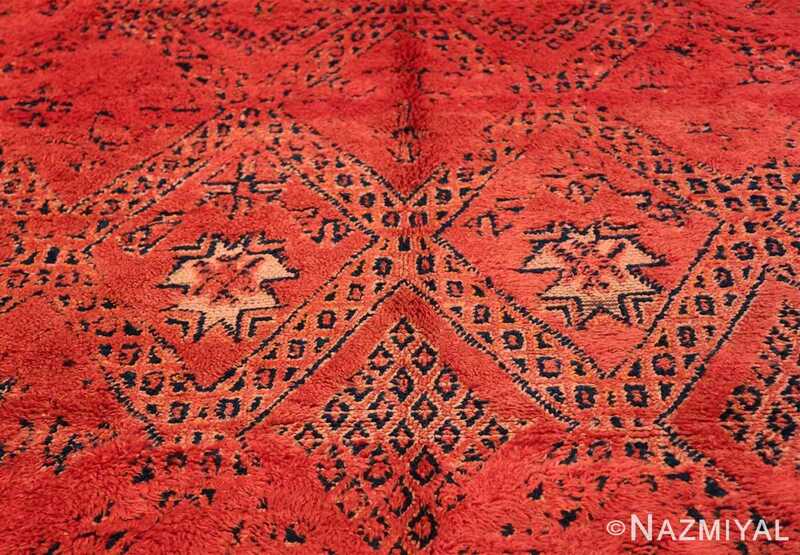 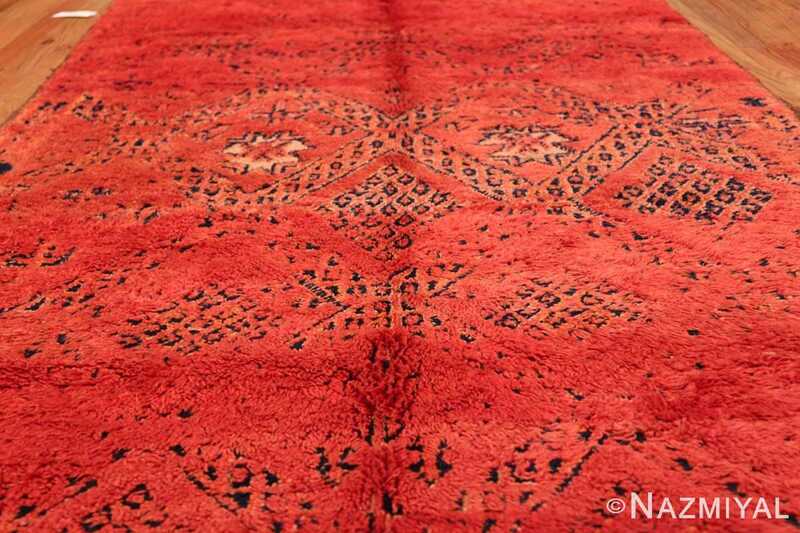 This magnificent red carpet has a distinctive diamond pattern in an all over design and border. 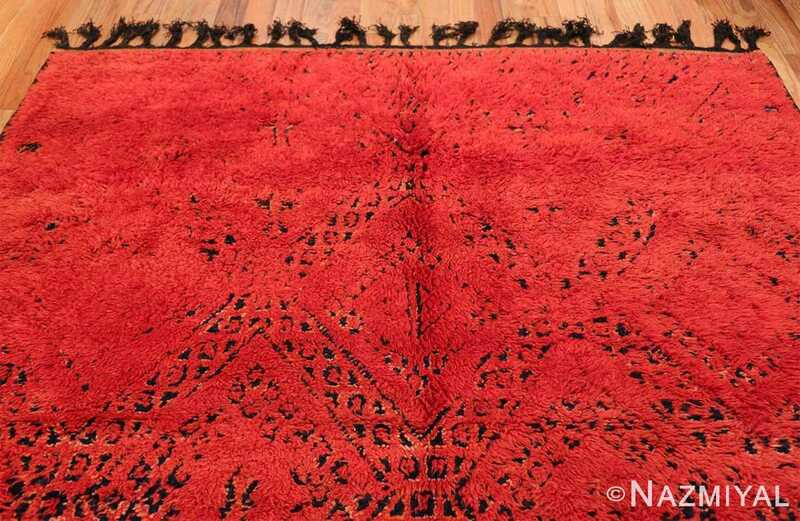 The reverse side of the shag Moroccan rug is what would normally be considered the backside, but it has something special to reveal on its own. 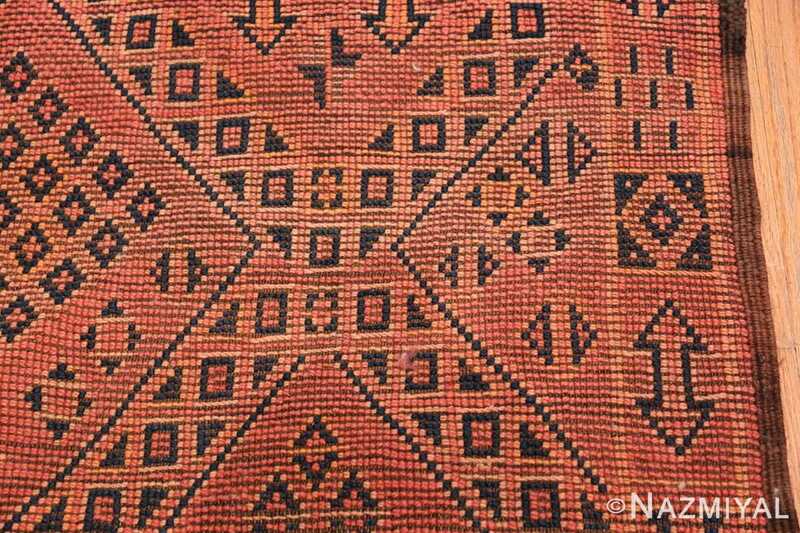 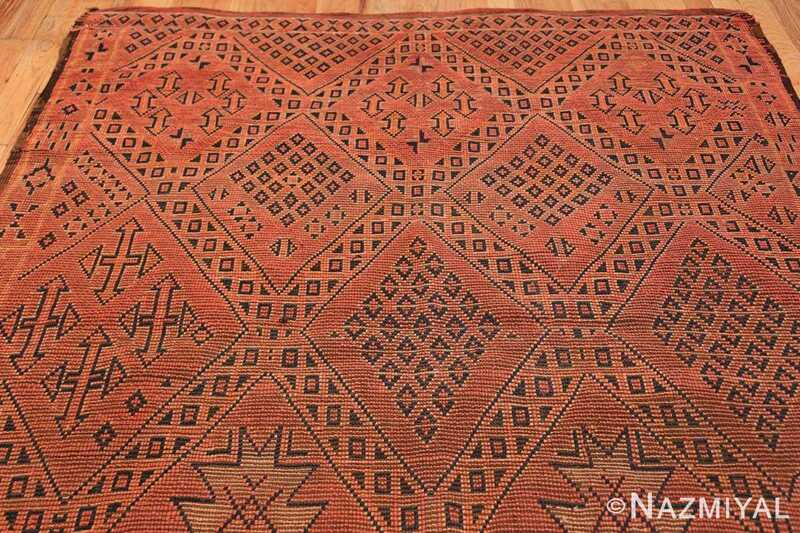 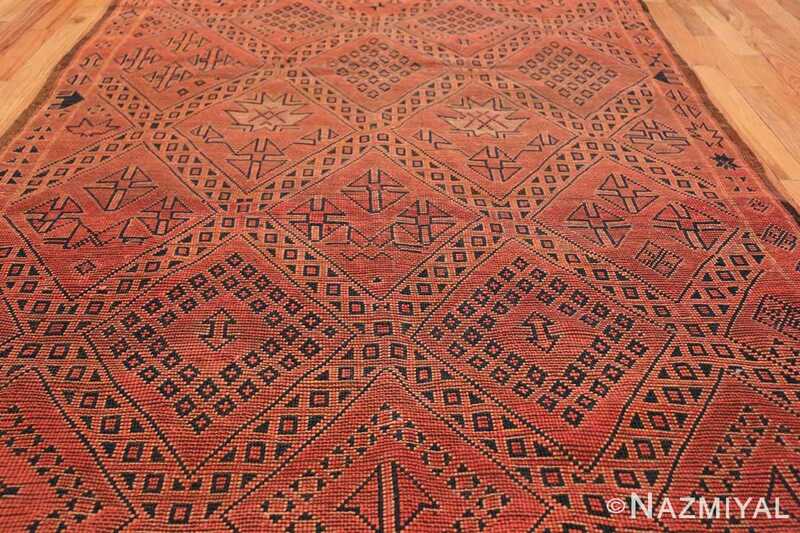 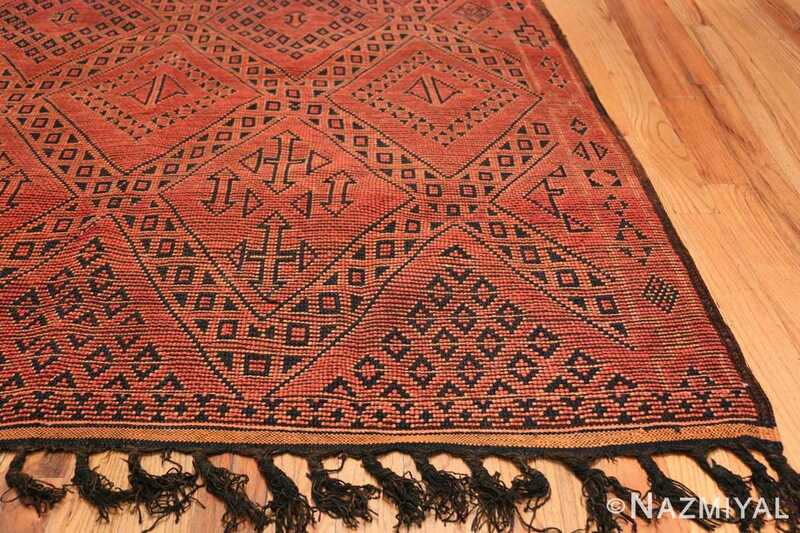 It has a more detailed version of the all over diamond pattern that is seen on the pile side of this highly artistic rug from Morocco. 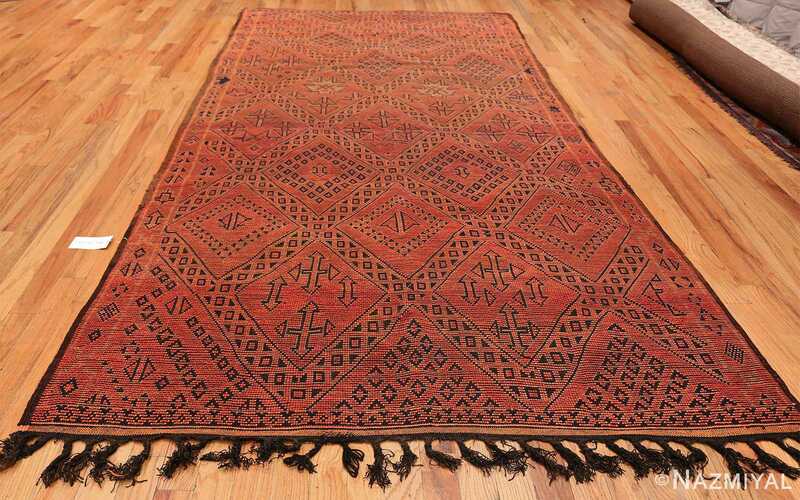 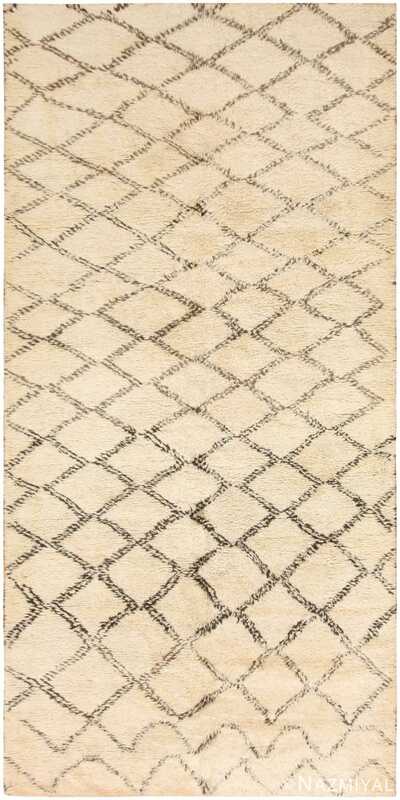 The all over design uses geometric shapes and traditional tribal motifs to give the rug a primitive, rustic feel. 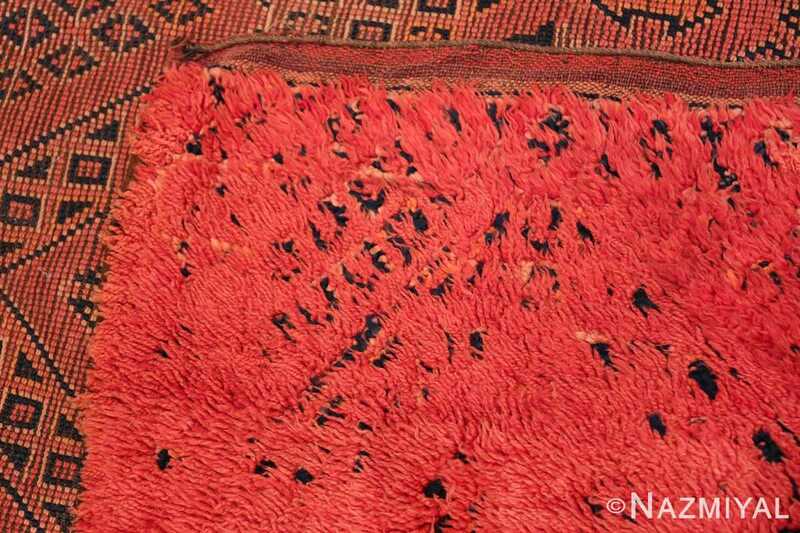 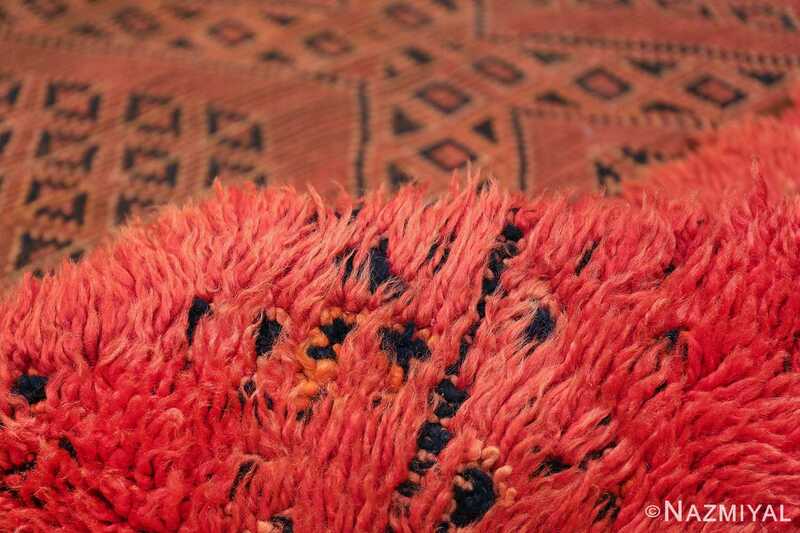 This fascinating weaving technique gives you two different ways to enjoy this exquisite Moroccan Berber carpet. 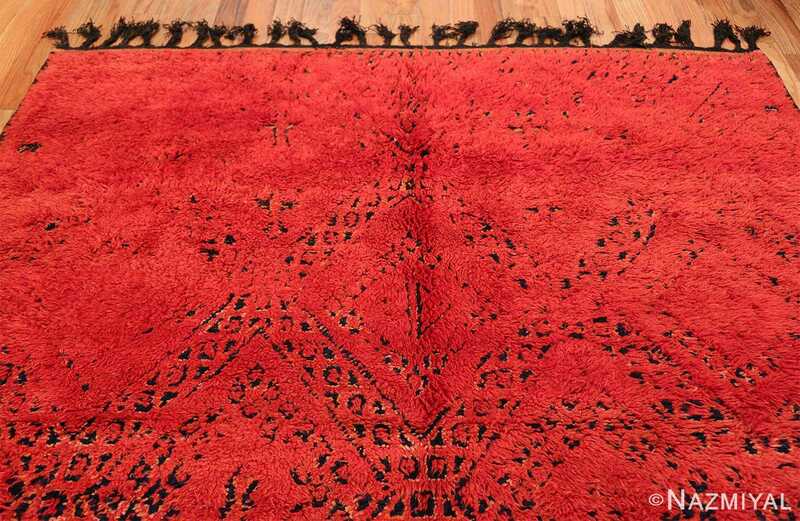 Regardless of which side you display, this highly artistic rug will be sure to be a conversation starter. 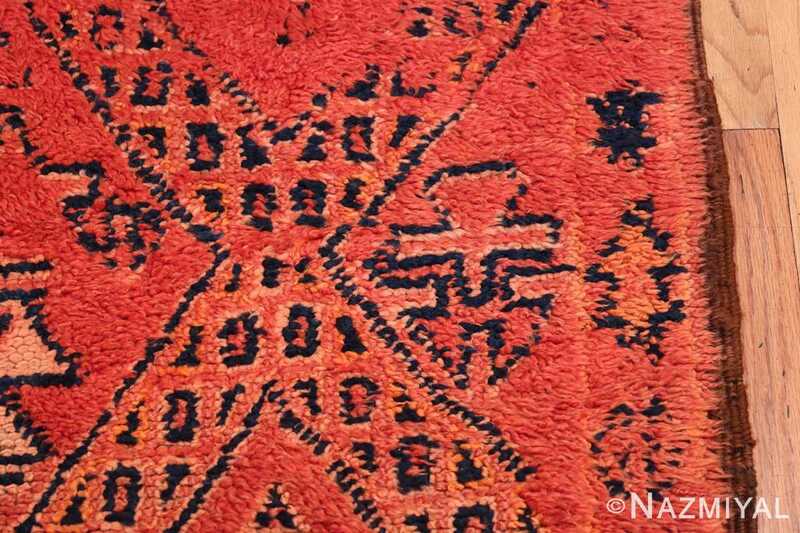 This unique mid 20th century vintage Berber Moroccan rug is a must for the serious Moroccan rug collector, or anyone who wants a carpet that adds a sense of character and personality to the room’s interior decor. 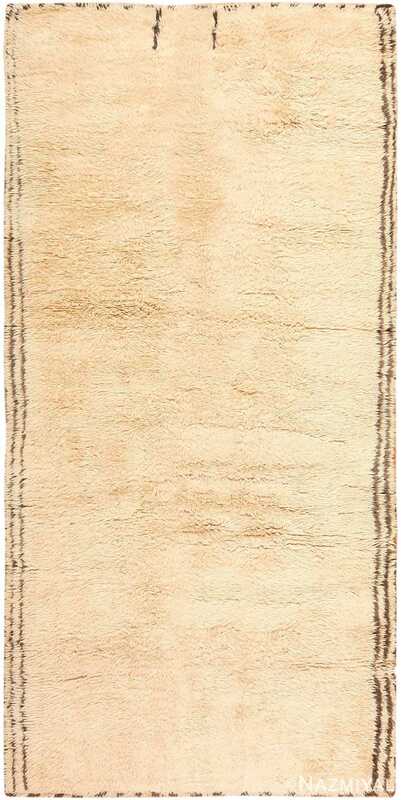 This Moroccan carpet features a beautiful ivory field and an intriguing arrangement of brown detail lines, the eccentricity of which creates a subtle hint of abstraction.